This calendar initially shows all school events. 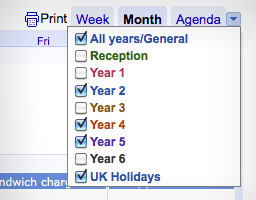 However, we have split the calendar into 8 categories which you can ‘filter’ using the small arrow at the top right of the calendar panel (next to ‘Agenda’). Tick or untick any of the categories to show/hide their events. You can also quickly switch views using the ‘Week’, ‘Month’ and ‘Agenda’ tabs. You can also view different dates using the arrows or the calendar date chooser. (And get back to ‘today’ using the top left button).